Counterpoint Research: "Almost 42% of smartphones sold globally in July 2018 sported two or more rear camera (dual+) sensors and this dual+ camera sensors adoption in smartphones is estimated to grow to 60% of total smartphone sales by the end of 2018." 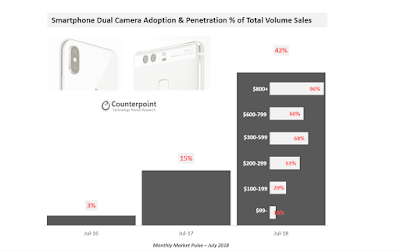 In just 12 months, dual+ camera penetration has gone from 15% to 42% and in 24 months from 3% to 42%. The new affordable premium “$300-$599” & high-tier “$200-$299” segments have grown the fastest adopting dual cameras. The mid-premium “$600-$700” has seen lower than expected adoption due to iPhone 8 but this adoption is way higher in Android smartphones. The super-premium “800+” segment is approaching ~100% penetration. OnePlus is leading the charge, closely followed by Huawei and with Apple at 49%. Google still has no dual cameras on its flagship Pixel phones and were relying on the stellar image quality thus far. However, with the premium segment heating up with dual camera sensors, Google will be under pressure to integrate this into their upcoming flagships. OEMs will also be keen to incorporate specialty cameras in order to stand out from the current crop of dual camera smartphones i.e. like Huawei has done with its P20 Pro by incorporating a stand alone black and white sensor.